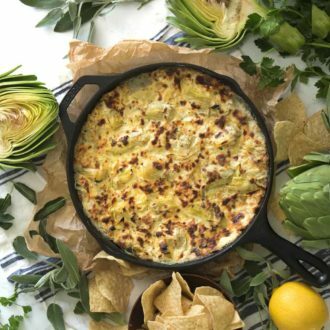 This amazing artichoke dip is beyond easy and can be made ahead of time and baked before serving! If you love spinach go ahead and add it! Just make sure to thaw and drain frozen spinach or wilt and drain fresh spinach before adding. No one likes a liquidy artichoke dip! I love artichoke dip but I’ve been so disappointed so many different times by greasy bland and salty dips. 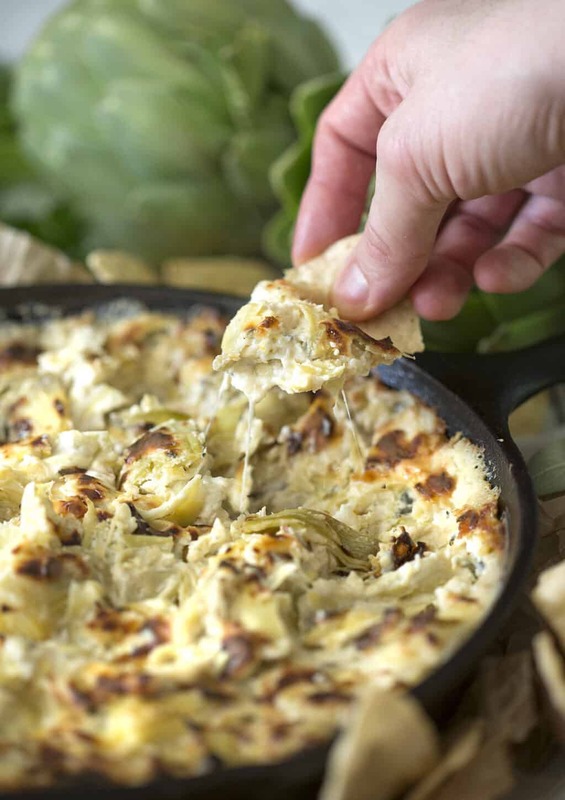 There’s just no excuse for a bad artichoke dip! I was reminded of this by my artichoke dip ravioli which has tons of flavor in each bite. My recipe has LOTs of lemon zest, garlic, artichokes and cheese. I also added a big handful of fried sage into the mix. 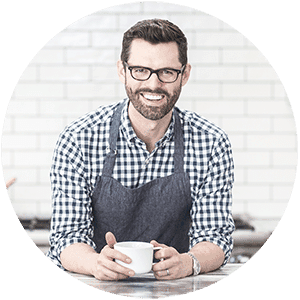 If you haven’t fired sage before you need to start now! It can basically go into anything from crispy potatoes to pasta. No preservatives and tons of flavor! I totally gorged myself on this and there was still a lot leftover, enough to stuff several chicken breasts and make a delicious dinner! If you’re not a lemon fan then go ahead and scale back on the zest, I loved it but might be a bit much for some people. Preheat to 350°F. Quarter the artichoke hearts. Zest a lemon. In a small saucepan, heat some olive oil and fry about 4-5 sage leaves at a time. Transfer fried leaves to a paper towel. Using the oil from the sage, add garlic and cook for a few minutes. In a large bowl, Crush the fried sage leaves in your hand and add to the bowl. Mix together cheeses and lemon zest. Add sour cream, cooked garlic and artichoke hearts. Give it a good mix. Transfer to an iron skillet. Bake for 30 min. Broil for about 4-5 minutes to brown the top. A very flavorful and easy artichoke dip with an extra kick from lemon zest and fried sage. Quarter the artichoke hearts. Zest a lemon. In a small saucepan, heat some olive oil and fry about 4-5 sage leaves at a time. Transfer fried leaves to a paper towel. Using the oil from the sage, add garlic and cook for a few minutes. 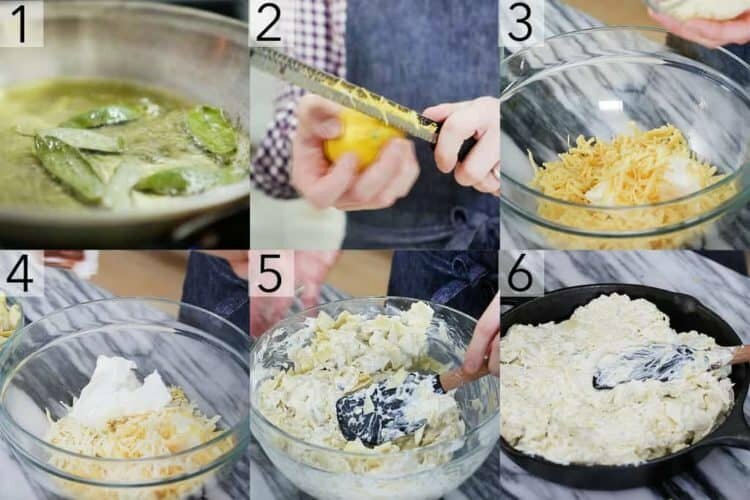 In a large bowl, mix together cheeses and lemon zest. Crush the fried sage leaves in your hand and add to the bowl. Add in cooked garlic and artichoke hearts. Transfer to an iron skillet. Bake for 30 minutes. Broil for about 4-5 min to brown the top. Wow! I love this idea! Beautiful photos! Year’s ago I had an artichoke dip served in the artichoke. We peeled off an artichoke ‘leaf’…dipped it into the dip. And scraped off the dip from the leaf with our teeth . It was so tasty!! I wonder if this is similar? You probably roasted or boiled the artichokes before! In this dish, I bought canned artichoke heart and filled with other ingredients! Check out my roasted artichoke recipe! Awesome! Thank you💙 I will try it!